Dinner and Concert of Ernest Bloch’s Schelomo performed by Kira Wang, a 14-year-old cellist and member of the Portland Youth Philharmonic. Please note that doors close by 6:50 pm. Through inescapable suffering, ardent yearning, and impenetrable passion and fury, Bloch’s Schelomo captures “the misery of the world.” Following the outbreak of World War I, and deeply disturbed by the suffering around him, Swiss-born American composer, Ernest Bloch sought inspiration for his newest composition from the biblical book of Ecclesiastes which features the story of King Solomon, whose name translates to “Schelomo.” Considered by many to be Bloch’s finest work, Schelomo, written from 1915-1916, was part of his “Jewish Cycle.” Rather than borrowing from traditional Jewish folk melodies, Bloch felt that his inspiration came from his own heritage and Bible study. Kira Wang, winner of the 2018-2019 PYP Concerto Competition, is a 14 year old freshman at Catlin Gabel. 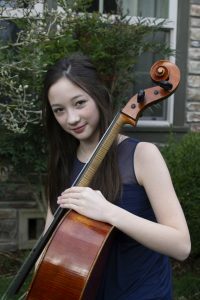 She began playing cello at the age of four, and has been studying with Dr. Valdine Mishkin for the past 9 years, with recent supplemental lessons from Diane Chaplin. Kira has previously won awards in the 2016 Oregon Mozart Players Young Soloist Competition, the 2016 Cascades Young Artists Competition, and the 2015 and 2018 MTNA Junior Strings competition.